For fourth of July, BigManLovesFoodSr wanted to relieve me of the majority of the cooking duties and make some ribs and barbecued chicken with my brother's help. I did not complain because his ribs are delicious, but I still wanted to make a couple sides and a dessert. For the main vegetable side, I put together a crunchy vegetable slaw. 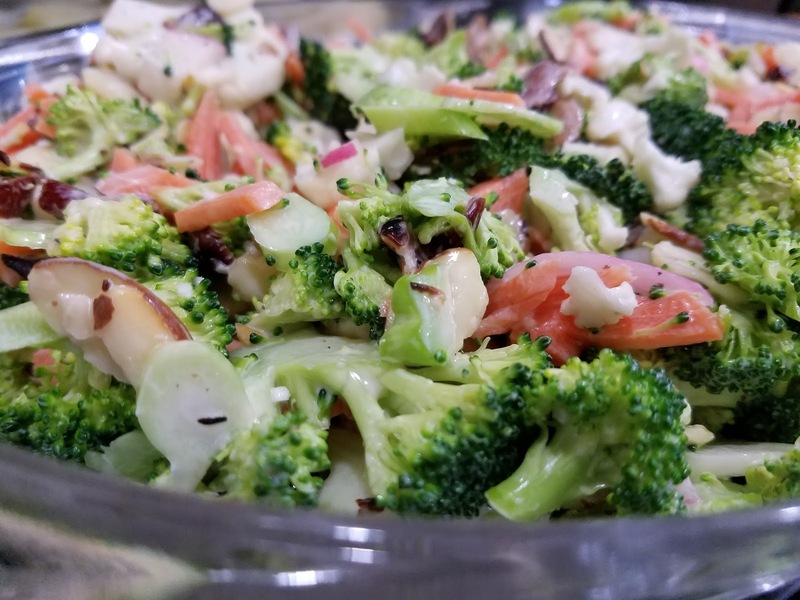 It was mostly based on this Broccoli Slaw Recipe from Smitten Kitchen. 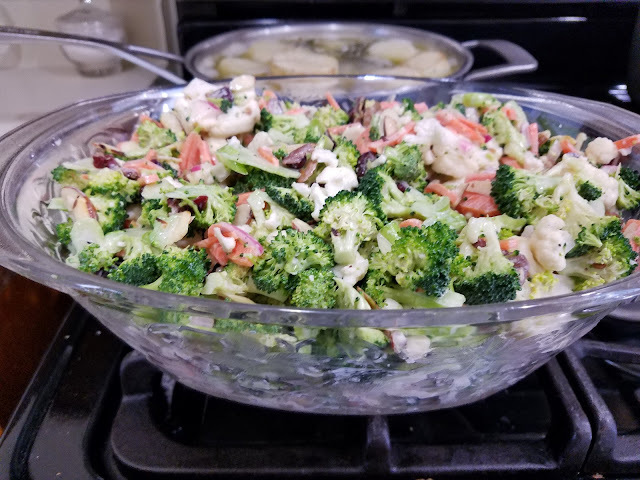 However, my mom had already bought a few other vegetables in addition to broccoli, so I threw it all together into this slaw. It was kind of the perfect foil to the fatty ribs, sticky barbecued chicken, and buttery potatoes we had. The salad itself added a much needed crunch to the plate since all the vegetables were still raw. The buttermilk dressing had some red onions quick pickled in sherry vinegar, so it was sharp and very tangy. 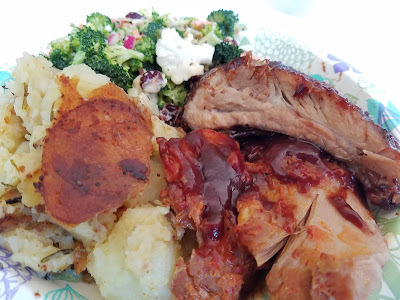 It cut through all the fattiness on the plate and refreshed the palate between bites. Plus, the cranberries were a nice sweet pop here and there. 1. Start off my finely chopping your onion, then mixing it with the vinegar and sugar plus a pinch of salt and a few grinds of pepper. I was going to be traveling with this salad, so I did it in a mason jar. Smitten Kitchen added raw red onion directly to the salad, but my family is not a huge fan. 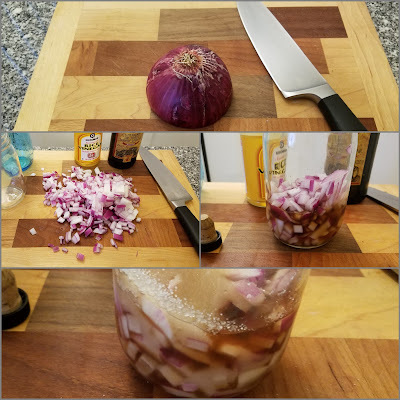 Instead, I wanted to mellow out the onion by letting it quick pickle in the vinegar. I'd leave it in at least an hour before mixing with the rest of the dressing. 2. In a separate mason jar I mixed the buttermilk and the mayo, with another pinch of salt and a few grinds of pepper. 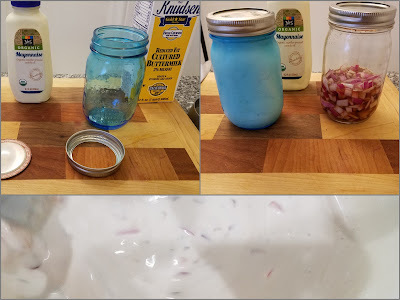 This was mostly because I was traveling--if you're just making it at home, you can just let the pickled onions sit and eventually mix in the buttermilk and mayo directly. When ready, mix the pickled onions with the broccoli. Taste and season if needed. 3. Then you want to prep your vegetables. 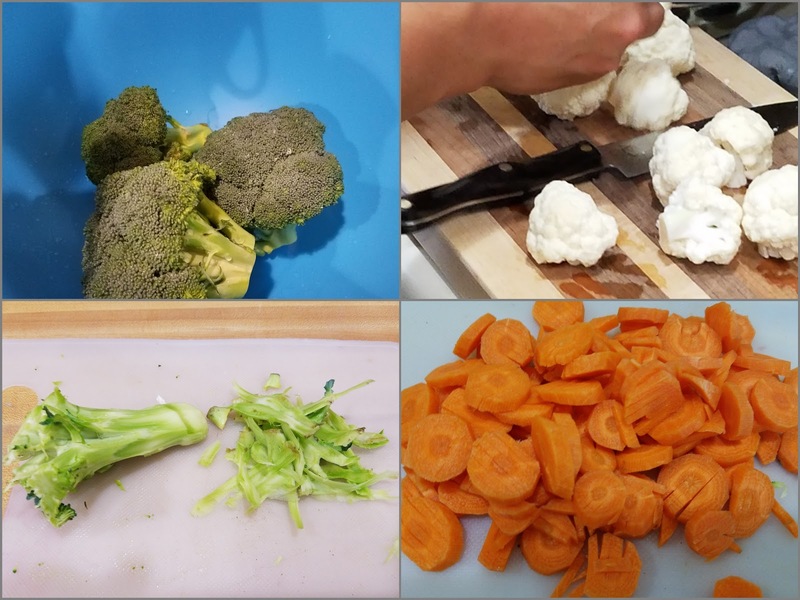 Thinly slice the broccoli and cauliflower florets. I peeled the broccoli stems, and then thinly sliced them on a mandolin (you can do it with a knife). I passed the carrots through the matchstick setting of my mandolin, but you can also thinly slice them. 4. Next, lightly toast your almonds in a dry pan. Keep and eye on them and mix them constantly because they will burn on you very quickly. 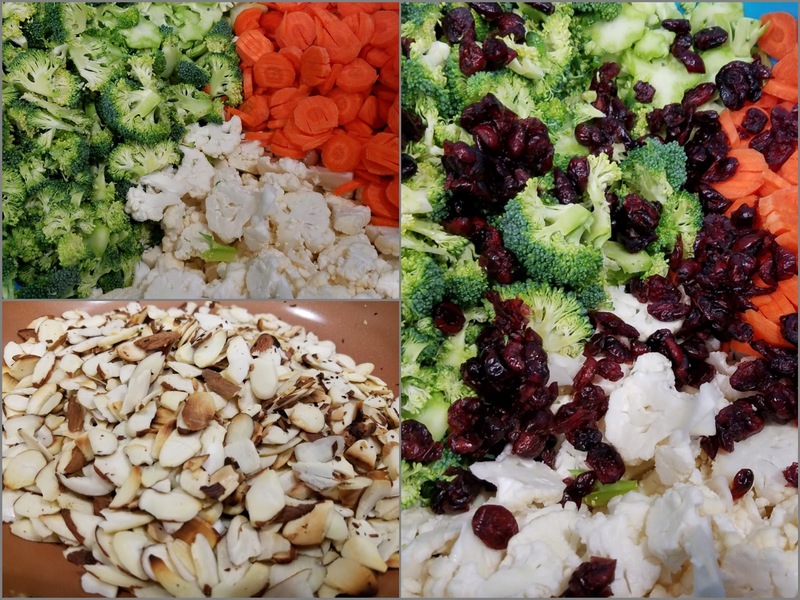 Add the toasted almonds and the cranberries to your vegetables. 5. 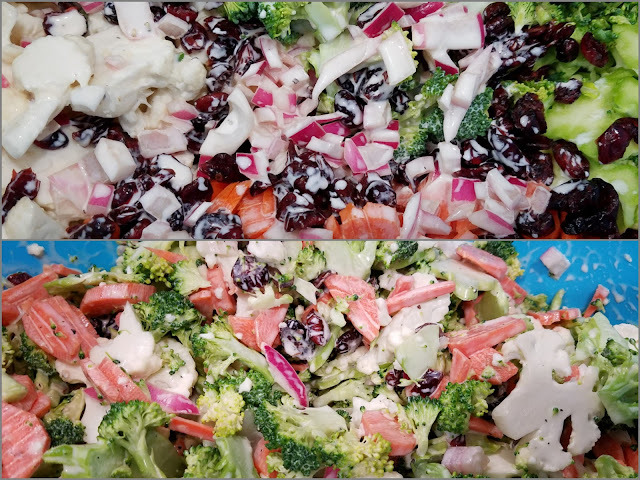 Finally, dress the salad. You might not need all the dressing, but everything should be nicely coated. Let it sit for at least an hour so all the flavors meld together, stirring every 15 minutes. 6. Plate your salad and enjoy!